SOUTHEASTERN N.C. — Following a disappointing 2014, sea turtle nests along the North Carolina coast are making a comeback. At the end of the nesting season last summer, the N.C. Wildlife Resources Commission reported a 58 percent decline in nests on the state’s beaches with only 565 recorded. The previous year had seen 1,303. But this summer, local beaches are reporting quite the opposite. The fluctuation in nests can, in part, be attributed to female turtles’ tendency to reproduce every two to three years, causing some years to be less fruitful than others. This summer Carolina Beach has seen 14 nests — already a dozen more than the New Hanover County town saw all of last year, said Nancy Busovne, coordinator of the Pleasure Island Sea Turtle Project. Kure Beach, meanwhile, has seen 11. On Topsail Island’s 26 miles of coastline, Terry Meyer, director of the island’s nesting program, said they began this year with a bang and brazen prediction that they might hit 100 nests after only seeing 53 last year. As of Wednesday, they had 64. While that is up from last year, Meyer said DNA results from the nests have shown that some of their local turtles are sharing their nests with other beaches. “The DNA results have been interesting,” she said. “Each turtle nests multiple times, but some use other habitats.” She said there have been indications that turtles nesting at Topsail Island have also nested at Camp Lejeune, Wrightsville Beach and Cape Lookout. 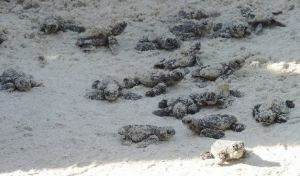 And it isn’t just loggerhead turtles that are visiting the Tar Heel State’s beaches. Just adding to their record year, Amico said Fort Fisher played host to a Kemp’s Ridley nest this summer and tests show it had a 100-percent success rate for its hatchlings. Kemp’s Ridleys are the smallest marine turtles in the world, and one of the most endangered. “That is rare for North Carolina and we think it is the only confirmed nest of its kind this year,” Amico said.